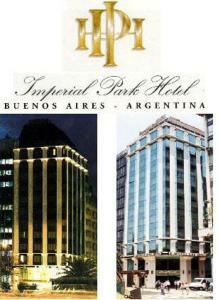 Imperial Park, Buenos Aires discount hotels and accommodation. Though to meet with the needs of the business man and the tourist.Strategically located in the heart of the city, it rises up powerful and distinguished, surrounded by theatres and restaurants, very near the government and financial district. Panoramic view of 9 de Julio Avenue, the widest one in the world. At a walking distance of Mayo Avenue, the Obelisk and Corrientes Avenue. A blend of balance and warm atmosphere equipped with a state of the art technology, to offer you comfort and enjoyment. And... the hospitality service and attention to details that will make you feel at home away from home. View photos, room descriptions and make online reservations at Imperial Park. Save on room prices at Imperial Park, Buenos Aires.